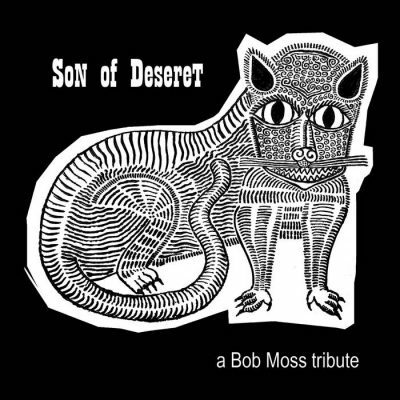 A collaboration between Mike Kirkland, Bad Brad Wheeler and a number of amazing local artists, Son of Deseret: A Bob Moss Tribute is an album that is as varied and special as the artist it celebrates: Bob Moss. Bob, a local legend in both the art and music world, touched many with his work. They could be found in many local venues, and his songs were known by not only their strange melodies and words but also by the unique voice that delivered them. The album contains 24 tracks that are as eccentric as Bob’s personality. To listen to each is to journey through a vast catalog written by a man who was a traveler. His love of all things interesting and unexplored flow through his songs. Their interpretations here offer new perspectives, range and dynamic to the stark and simple tunes written most often on his prized banjo. The haunting opening track, “True Love is Hard to Find,” by Chubby Bunny, is a deceptively feel-good pop song with an undercurrent of darkness in the lyrics. “Killer’s Lament,” as played by Aldine Strychnine, and Wheeler’s rendition of “Road to Vegas” take their original songs and turn them toward Nick Cave-style murder ballads. And Timechimp (featuring Davey Parish)’s “You Have a Pretty Bummy” revels in its ridiculousness while being a catchy ear worm that you will end up singing for the rest of the day.